If you're a homeowner looking to perform some major remodeling tasks, a business owner planning on repairing a part of your building, or a general contractor working in this field, you need to be using breathable floor protection. 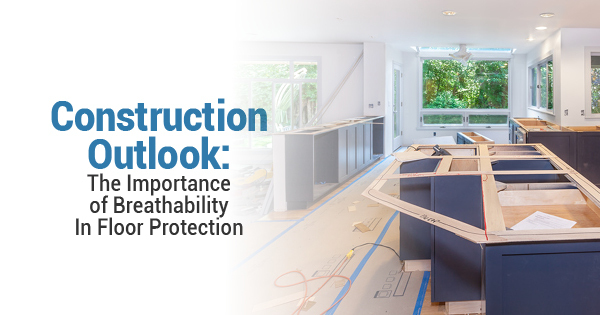 Protecting floors during construction jobs might not be the first thing you think of, but it's extremely important. The last thing you want to do when working on a construction project is to accidently cause damage. Certain renovation and construction tasks involve heavy machinery, sharp tools, and all types of invasive workmanship. With quality temporary floor coverings, you'll be able to protect your floors during these various jobs, saving you plenty of money in the long run. Ram Board floor protection and construction edge protection product work great on all types of flooring surfaces, including hardwood floors, tile, concrete, linoleum, terrazzo, marble, laminate, VCT, and many more. Certain surfaces, such as concrete or freshly finished floors, require time to cure. This means you cannot simply cover the floors with plastic or generic cardboard because that will prevent the surfaces from breathing and curing correctly. Ram Board on the other hand is a breathable product, so you don’t have to worry about that. Once your surfaces have completely dried, you can install Ram Board to protect them from damage, and while they are covered, Ram Board’s formula allows air to pass through, so your floors can continue to cure. When you are done, this temporary floor protection can be rolled out right away, flattened over any surface, and is even reusable. To find out more about Ram Board products, visit Ramboard.com today.